E & M Combustion, Spanish engineering specialized in the design and manufacture of combustion equipment and systems for industrial applications, launches the new JBD-PA gas burner for preheated air with a temperature up to 400ºC. 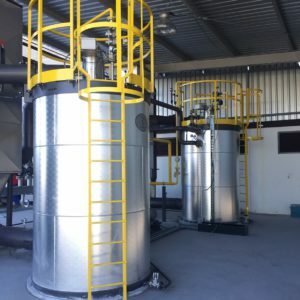 The equipment is adaptable to all types of combustion chambers, It has Low Nox heads and has electronic regulation, which controls the entire burner and allows to warn of the breakdowns, reducing the time spent in repairs. The innovative design of the JBD-PA gas burner for preheated air is not only aesthetic, but also allows us to obtain several features that considerably improves those whith up to now have been obtained with conventional designs of burners. JBD-PA gas burner for preheated air have the feature that the fan is not integrated into the device. The burner body is made of carbon steel sheet whith a box attached to it where we find the air flaps. The air enters the equipment trough the box where its flow is controlled and them enters the combustion head. This JBD-PA gas burners have the advantage that it can be placed in the boiler at any angle of rotation over the horizontal. They can also be installed in vertical position. Another advantage of these burners is that they can work with pre-heated air up to a temperature of 400 ° C, therefor considerably increasing the combustion performance and the efficiency of the boiler. To avoid this heat to be transmitted to the outside, these JBD-PA gas burners for preheated air carry an insulation around the housing that makes the temperature transmitted to the outside through this body not to exceed of 40ºC. This insulation is covered by a stainless steel plate that protects it from any kind of damage or oxidation. The fact of carrying that insulation also supposes a reduction of the noise of the combustion. The burner is controlled from the external control panel which includes a switchboard for electronic regulation. This controls the diffetent servo-motors for the adjustment of the air flaps and the butterfly valve for gas. This switchboard controls all the operations of the burner. Having this display allows us, at a glance, to know straight away the condition of the burner and the fault warnings, and when these have occurred. This greatly reduces the time spent on repairs of faults or breakdowns. 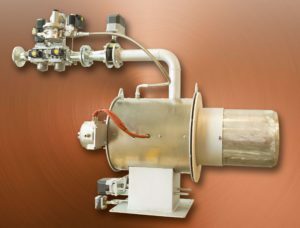 The Low Nox heads of the burner have been carefully designed to achieve low levels of polluting emissions to be environmentally friendly as well as achieving a high level of heat optimization. E & M Combustión is a Spanish company created in 2004 and specialized in the design and manufacture of industrial burners and combustion generators with innovative technologies, with low emissions and adapted to the needs of its customers, allowing a considerable saving of energy. It operates mainly in the energy, petrochemical, oil & gas and part of the food sector. The company is present with equipment implanted in more than 30 countries and destines more than 70% of its production to the export.